DTMF Module Version1 (RM0033) decodes DTMF signal either from an audio source or phone line to 4 bit binary TTL(5V) level output. It also indicates outputs with LED. It can be used directly with microcontrollers to develop various DTMF related applications like remote monitoring, remote control, Caller ID, Auto Dialer. 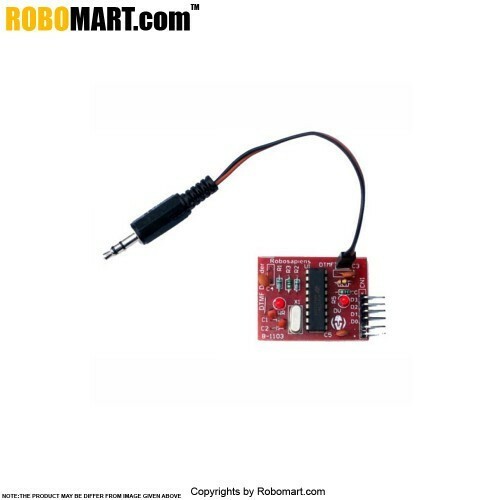 This module can easily be used in conjunction with any of Robosapiens development boards and develop mobile operated robots and gadgets. Highly accurate filter circuits are implemented to divide tone signals into high frequency and low frequency signal. Basically it is an 18 pin IC. 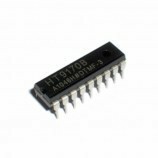 The HT9170 series consist of three bandpass filters and two digital decoder circuits to convert a tone DTMF signal into some signal output. 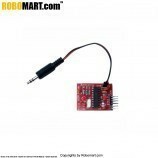 It has a built-in amplifier circuit to adjust the input signal. The pre-filter circuit may filter out the dialing tone of 350Hz to 400Hz signal, and then use the high-pass and low-pass filters to split into high and low frequency signals. When the HT9170 receives an effective tone (DTMF) signal, the DV pin goes high and the tone code (DTMF) signal is transferred to its internal circuitry for decoding. After setting, the OE pin goes high, the DTMF decoder will appear on pins D0~D3. A standard 3.579545MHz crystal connected to X1 and X2 terminals implements the oscillator function. 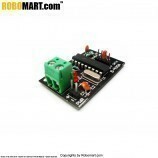 The kit will work on 3V to 5V DC therefore the kit can also be used with say 3.3V logic.